Ever wonder why some body parts hurt even when there’s nothing biologically wrong with you? Sometimes there are emotional or energetic reasons for these. Louise Hay, a New York Times best-selling author, explains the mental causes for physical illness. She includes a lengthy list of various body aches, as well as some serious conditions, and details the probably causes and new thought patterns that can help overcome them, based on over 30 years of experience in working with clients. While I have not found the list to be a perfect match with reality, it certainly opens the door for self-awareness and self-exploration to support the healing process on higher level. Using these affirmations as a launching point with PSYCH-K further enhances the healing process. 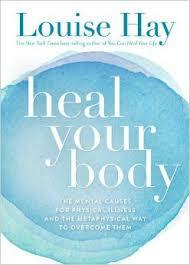 Buy Heal Your Body by Louise Hay on Amazon. ← What is Abhyanga Massage and Body Therapy?